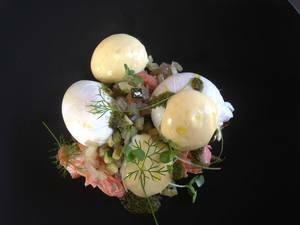 Waiheke Island Yacht Club’s new brunch dish of Mt. Cook Alpine smoked salmon and free-range eggs. Photo via Facebook. ~WAIHEKE ISLAND YACHT CLUB~ has just started serving brunch, and the airy and open atmosphere is quite perfect for it. Come by on Saturday or Sunday for brunch dishes like poached eggs and applewood smoked bacon, lamb sausages, homemade baked beans, hash browns, mushrooms, and spinach ($18); Mt. Cook Alpine smoked salmon, escabeche, salsa verde, soft herbs, hollandaise, and eggs ($16); and trumpet mushrooms, zucchini, vine-ripened tomatoes, eggplant chutney, spinach, and poached eggs ($14). There are also two kinds of burgers: the Emirates Team NZ burger, with 100 percent New Zealand beef and lamb, beetroot, Kikorangi blue cheese, and egg; and the Team Oracle Racing burger, with Snake River Kobe, caramelized onion, smoked tomato, and Monterey Jack cheese (both are $15). There are a few salad options as well. I have already praised the Red Snapper, and there’s a Bloody Mary on special for $6; DJ Seven will be playing music (although this weekend is the Sweet Mix Kids). Sat-Sun 10am-3pm. Pier 29, 1256 The Embarcadero, 415-956-1048. Downtown workers: did you know you can now grab breakfast at the new ~WISE SONS DELI~ at the Contemporary Jewish Museum in SoMa? The to-go window is now open on weekdays at 8am, serving bialys and some new breakfast sandwiches, like bialy and lox, and a pastrami and egg sandwich, plus De La Paz Coffee. You can call ahead to avoid the rush: 415-655-7887. 736 Mission St. at 3rd St.